Today’s Friday freebie is for all the make-up lovers out there… We have two gorgeous make-up palettes from NYX Cosmetics to give away! 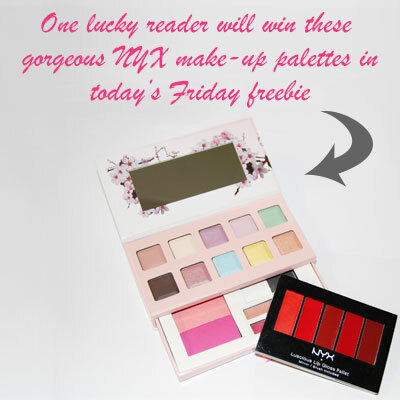 One lucky reader will win the NYX Luscious Lip Gloss Pallet containing five different shades of lip colour and the NYX Spring Fling make-up palette containing eye shadow, blusher and lip gloss. To enter, answer the question below before 3:30pm today and submit your details.